Notice how this piece of scale armor only covers his torso. It's the only image I have found that depicts both scale armor and maille being worn on a single character. I'm guessing he's supposed to be pretty high-ranking, which might be how he can afford two forms of armor. Most other depictions show scale armor as being the only protection for the wearer. Unfortunately, these images don't do a lot for me in determining construction details. 1) What kind of backing would these scales be attached to? Linen? Padded linen (like a gambeson)? Thin leather? I hope the answer is one of the linen options. Sewing through leather is a pretty daunting task. 2) Should I sew them on with waxed linen thread? 3) Each row of scales should overlap the row below, but should each scale also overlap the scale adjacent to it? I can't tell, from the manuscripts, whether they are supposed to be overlapping on the sides or not. Given the varying thicknesses of my scales, this part might be trickier than just laying them out edge to edge. 4) Finally, how many holes do I need to punch in each scale? The manuscripts don't really show how each scale is attached. The modern illustrations I've seen seem to show each scale as having two holes on the top. However, this would mean that the scales would only be secured at the top, leaving the bottom vulnerable to upward thrusts, which I suppose could well have been the case, if it is made hastily and cheaply, as only a poor man could afford. I appreciate any suggestions anyone here could offer on the subject. Thank you, very much. Don't waste your money on bees wax; it was never used to make armour. Cuir bouilli armour was made either by water hardening or by baking in an oven. But scale armour was more often made from rawhide rather than leather. Looking at the modern image you posted it looks like scale armour (although I don't believe there have been leather scales found, so I don't know how authentic it would be to use leather). The image you posted of the knight also wearing mail looks to be lamellar armour rather than scale armour, however as with most images, this is open to interpretation. There are very different methods of construction for scale armour and lamellar. With scale armour, the scales are punched at the top for attaching to a backing, such as linen, and often punched at the sides as well to attach to the next scale in the row using a wire staple. Your assumption is correct, an upward thrust will bypass the armour. There seems to be some evidence of occasions where the rows have also been linked together to reduce the risk from an upward thrust, but this reduces flexibility. Lamellar armour on the other hand does not have a backing material, and is formed by the lamellar pieces being tied together to the ones next to and above and below, generally using leather thonging or similar. This is often seen as the weakness of this type of armour, as a cut to the leather thonging can cause it to split open and come apart. I hope that helps a little? I don't have any inherent objection to hardened leather scales, though as Dan points out all the examples that we know of from other times and places tend to be rawhide. And right, NOT wax for hardening! Note that there is at least one reference to horn scales. I've seen photos of a reenactor with a horn scale shirt very similar to what you're planning, and it's very exciting. The problem is that we just don't have any archeological evidence to work from! There is certainly enough pictoral evidence to be reasonably sure that scale armor was used. And although the images are pretty consistent regarding the size of the scales, I can't help thinking that the real scales might have been smaller. And of course we can't tell the material from the pictures, so thin iron or even copper alloy can't be ruled out. This was NOT armor for a "poor" man. Poorer than stinking rich, possibly! But what folks called "poor" back then was probably so destitute that he would not be liable for military duty at all. Looks like you have several types of leather? The pale stuff is probably vegetable-tanned, which will harden nicely and is reasonably historically accurate for tanned leather. The darker ones? Suede? Some sort of modern "latigo"? Chances are, it's a modern chrome-tan of some sort, and it won't harden well if at all. You'll never make the colors all match, either. Yes. You can also get larger spools or balls of hemp easily enough, but I found the cheapest stuff was a little lumpy which made sewing a pain. Go with white or natural. Skip the "artificial sinew", it's nylon. The million dollar question. And the answer is, We don't know! The illustrations all *look* like there is no lateral overlap (side to side). But we also know that the Romans, for instance, ALWAYS overlapped their scales. 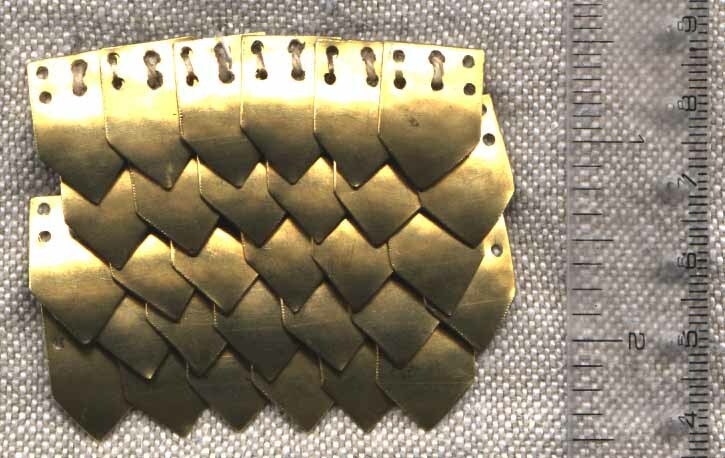 In fact, Roman scales were wired together in horizontal rows, which were then sewn/laced to the backing. Of course, Roman scales that survive are almost all iron or brass, and very thin, so overlapping was not only easy but necessary. (Any particular spot has 3 or 4 layers of metal.) I did *not* overlap my Bronze Age scales laterally, and I still feel like I should have. Overlapping just makes it vastly more protective. You can get thin rawhide that is a LOT tougher than much thicker leather, so it would be a lot less bulky when overlapped. There is a modern tendency to think that medieval scale armor must have been "dumbed down" from how the Romans made it, but that is clearly not the case with mail! Nor with swords, helmets, and many non-military items. The whole "vulnerable to an upward thrust" thing is way overblown. I wouldn't go so far as to say it's a complete myth, but it is very hard to get the steep angle you'd need even with a sword, and you'd have to be very close to your opponent--basically inside his shield. And the smaller the scales, the less chance of that happening, simply from how the armor moves to absorb a blow. That said, mail is still a MUCH better armor overall! Also note that your last illustration shows a KNIGHT, not a poor man at all, and that the visible holes on his scales are just *wrong*. Vertical overlap is typically half the height of the scale, so you always have at least 2 layers. The holes are hidden (except along some edges, etc.). If you have your heart set on using leather instead of rawhide then most of the leather you have won't harden. You'll have to do it artificially with something such as diluted glue. Regrettably, I can't afford to buy rawhide. I already had the leather, so I'll have to make due with that. I can definitely see the advantage to using rawhide over leather, though. I'll set about collecting rawhide scraps whenever i find them from now on, for when I tackle this project again. Appreciate the water-over-beeswax tip. Thank you. You're correct. Out of the four pieces I dunked in boiling water last night., only the veg-tanned stuff hardened, two others stiffened, and the fourth one stiffened and shrank. Though it pains me to say it, I might have to try the diluted glue method. Is there a specific process for that? It was helpful thank you. It is for the very reason you listed that I opted not to go with Lamellar. I had no idea about the wire staple. Thank you. Right you are about horn being an option. If it was even slightly within my price range I probably would save up to do that, but I don't foresee that being a possibility, until I strike it rich by slipping on the front porch at Bill Gates' house and suing. If you have any pictures of that reenactor's horn harness, I'd love to see them. I think I had also heard that bone scales were possibly used, as well. "poor" probably wasn't the best word, as a poor man probably wouldn't have any armor at all. But I can't imagine that leather scale armor would have been nearly as expensive as a maille hauberk. Perhaps iron or other such scales would have made it pretty pricey, but leather? As for the differing types of leather: I've been collecting scraps of different thick leather over the years for this purpose. I didn't realize they would react differently in the hardening process. Of course, at this time, I was still planning on using beeswax as I had been advised on another thread. The veg-tanned stuff did harden well. Two other types merely stiffened, and one shrank. I doubt I have enough veg-tanned stuff to make the whole piece of armor. So I'll probably boil the veg-tanned in water, and use the diluted glue solution for the others, lacking historical accuracy, though it may be. I never had any intent that they would match in color. The varying shades of brown/tan lend support to the notion that this particular piece was for a man who was less well-off than his maille-clad colleagues. I'll probably go with double-layered linen for the backing then (have that on hand), and natural waxed linen thread to hold them on. Hmmm, given the varying thicknesses of my leather, I might have to go without the lateral overlap and save that for when I do the more accurate rawhide version. That being the case, perhaps the best hole lay out is the four holes arranged in a square. As for the illustration of the mounted Norman, he is a knight, that's true, but I think his scales are supposed to be iron. If I recall the description of that figure calls attention to the fact that the threading wouldn't be visible and that it was, more or less, drawn that way to show how they were attached (although, not very effectively if you was to ask me). Either you ran into the same problem or you're flipin' mind reader. I have puzzled and puzzled, until my puzzler grows sore over what to do about the shoulder. One modern illustration shows the scales up there just being as just being laid top-to-top, but that offers an incredibly small amount of protection to a very sensitive area, which would be the target of many a downward blow. Perhaps a row of scales pointing out toward your arm covering the seam? Curious. Good final piece of advice there. Looks like my "Untouchables" DVDs are going to see some action again. One other question, I was planning on doing the armor in tabbard style: One long rectangle of fabric with a head hole, then belted around the waste, with the front overlapping the back. Does this seem appropriate, or should the front and back be sewn together at the sides, with arm holes? Thank you gentlemen for all the help, thus far. Things aren't going exactly as planned, but they seldom do. I have come to terms with the fact that this won't be the best piece I've made prior to kicking the bucket, but it will be a good practice piece and a template for when I make a more accurate set of armor. Leather seems to have been fairly expensive in western Europe during the time you are interested in. It gets cheaper and more common the further east you look. 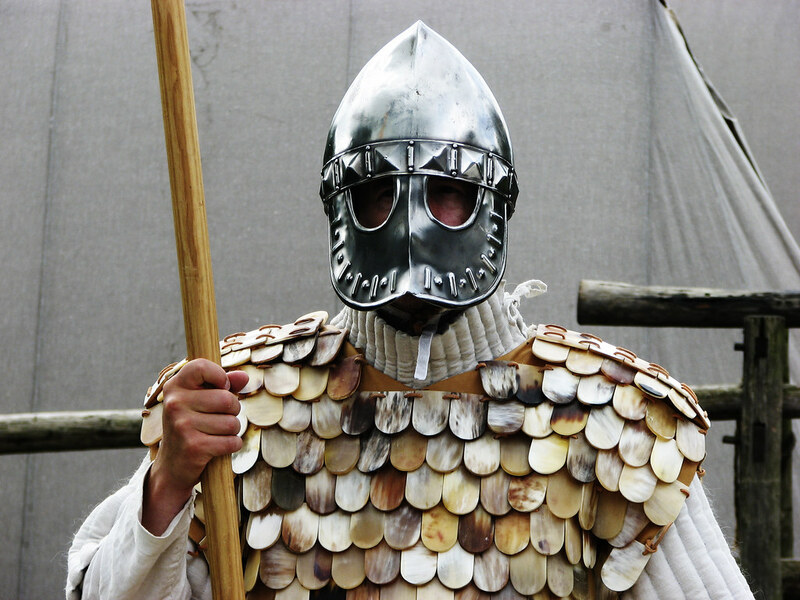 Not sure we'd find much bone scale armor outside of Inuit or Polynesian cultures. When leather armor does appear, it never seems to be "cheap" armor. And it often *supplements* mail rather than replacing it. There are better ways to get that idea across. Through the Viking era, for instance, if you're less well-off you just don't have mail. Spear, shield, helmet, maybe a sword. Starting in the 12th century we see gambesons being the usual armor for commoners, with mail for anyone of means. Scale armor of any sort was *probably* less expensive than mail, but still out of reach of most people. There wasn't much of a "middle class", after all, mostly farmers with a thin topping of filthy rich. The farther you get into the middle ages, the more options there are for "in between" armor, including some lower-quality mail, apparently. That's what I did! Roman shirts often use the "pinecone" method, which starts with a ring of scales (pointing outwards) around the neck opening, growing outwards like a round cape or collar. This morphs into horizontal rows as it approaches armpit level, then just continues in straight rows to the bottom. But nothing in medieval artwork looks like that! The top row of scales can either be cut a little shorter to match the angled top edge, or just overlapped a little more. I would definitely have one side closed, the other open for putting it on. Add ties or straps for closing that side. The front and back can be slit at the hem like a surcoat or mailshirt. Footnote In Oakeshott's Archaeology Of Weapons, p268. Yes wax was used to make cuir bouilli. But it was never used to make armour. 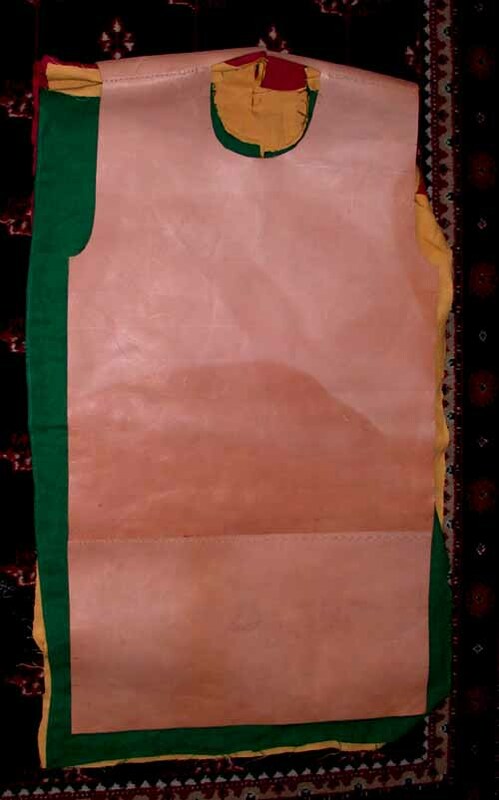 Waxed leather was used to make things such as boxes and bottles. I hope New Years found you all well. Thank you all for the advice. Hmmm, perhaps I must rethink the persona of the man wearing this armor. Thanks for the picture. His scales seem to alter between overlap or just side by side. I can't imagine how much that beauty set him back. Thank you for the picture of your backing and the tips regarding the pattern. A one-sided closure seems like a great idea. You're welcome! In fairness, there *were* some soldiers "in between" dirt farmers and stinking rich. Townsmen (craftsmen, merchants), professionals like sergeants, non-nobles in the retinue of a nobleman, etc. We also have references to (and illustrations of) some items that are not mentioned in militia laws or regulations. Sometimes people got fined for not having what they were supposed to have. Of course, militia regulations were not meant to cover professional soldiers or a knight's retinue. But you have some options. I tend not to worry about "persona", but focus instead on the clothing and armor. People would rather see the STUFF than hear some dubious life story. Pick an illustration and go for it, using as much evidence from artifacts as you can, to back it up. Once in a while you'll run across someone who has a source for cheap or free cow horns, maybe a one-time offer or something. Or *scraps* of horn from a craftsman, possibly. Catch an opportunity like that, and yeah, you'll have a nice cheap shirt of horn scale armor! Otherwise, yup, stuff costs money. It's all about what you really WANT, and how determined you are to get it. Unlike in the middle ages, we can frequently get steel for free from trash piles and dumpsters, so what may have been "cheaper" for them is more expensive for us.